This review is right on the money. I loved that this story has grown far beyond two lovers dramatic relationship. I agree, many authors would leave it there and have an ok book, but Taylor takes it so far above and beyond to a book that is truely magical. I've said this before, but I sincerely think this series is the best paranormal romance I've ever read. I'm also kind of hoping that Karou and Akiva don't get together, because they aren't the same people that they once were, and they are allowed to choose a different future. I am extremely excited to read the next book, I'm sure it will be just as heart wrenching. PS I'm totally on team Ziri anyway, HOLLA! THIS review. Yes. You've hit the nail on the head here, Misty. 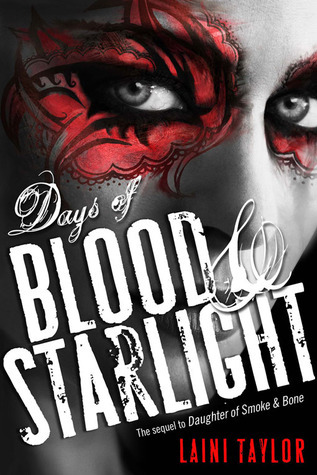 I think you expressed everything I felt about Blood & Starlight perfectly. And Amanda - I'm on the fence. I think I still want them together because I want them to overcome and lead by example, in a way. I don't want small minds to have ended them. But I would also respect the story - and Taylor - if they didn't get together in the end. I would understand, and it would make sense. And I DO like Ziri, BUT (and maybe this is weird), I totally want to see him woo Liraz. Seriously, there is SOMETHING that could be kinda perfect there. Beautifully written review! You managed to gush just the right amount while still writing a just-right review and communicating what the book was like and about, where I think I went a tad overboard with mine...then again, I have yet to propose marriage to Laini so you might still have me beat. I love how you phrase that: "she went in with a knife instead of a quill." But so fitting for the subject matter of this second book, I'm thinking. And I love how you point out that the story always comes back to Karou and Akiva and the choices they make. That's what made Daughter of Smoke and Bone so wonderful for me; I'm eager to see what Taylor does in the sequel! I read that Goodreads review. I'm not sure what my opinion is on that quite yet, since I haven't read the book. I have the sense that it won't bother me that much, since this is fiction, and, even more so than that, fantasy. At some points you need to accept that things won't be accounted for in fantasies quite the same way they will as in our real, tangible world. But I'm curious to see what I think after reading the book! Amanda - Hopefully that review won't bias you while you're reading. I completely see where she is coming from, and I think it makes for an interesting discussion, but I also don't think books necessarily have a responsibility to be anything other than what they are. Does that make sense? I think this may be my favorite review I've read for DOB&S. You took every feeling I had towards this book and expounded on them perfectly. I just...can it be 2014 now? I need that last book. Thanks, Kelly! And yes, it NEEDS to get here already!! That is my reaction. An absolutely amazing book. I always think I will like Daughter of Smoke and Bone that bit more than this book, but nevertheless it is a fabulous read.